Bitcoin’s divisibility is one of its many features. People that have never used cryptocurrencies before might think that they are required to purchase a whole Bitcoin to transact with the new form of currency; however, one Bitcoin is divisible into 100 million units and its smallest unit is called a Satoshi. Regular currencies only use 2 decimal places; while Bitcoin, normally uses 8 decimal places. The divisibility of Bitcoin comes from the currency’s maximum supply and other factors, such as the block reward which will be discussed on another post in the future. The smallest fraction of a Bitcoin, 0.00000001 BTC, or 1 Satoshi, was named to honor its mysterious creator, Satoshi Nakamoto. With the growth of cryptocurrencies, other popular divisibility units of Bitcoin have emerged. For example, a “Finney”, which was named after one of Bitcoin’s early developers, Hal Finney, is used. In addition, companies in the space and users have pushed for the implementation of alternate units like the “bit”. One “Finney” is 0.00000010 BTC (10 Satoshis) and one “bit” is 0.00000100 BTC (100 Satoshis). A milliBitcoin, millibit, or millie which equals 0.00100000 BTC (100,000 Satoshis), a centiBitcoin or bitcent is 0.01000000 BTC (1,000,000 Satoshis), and a deciBitcoin refers to 0.10000000 BTC (10,000,000 Satoshis). 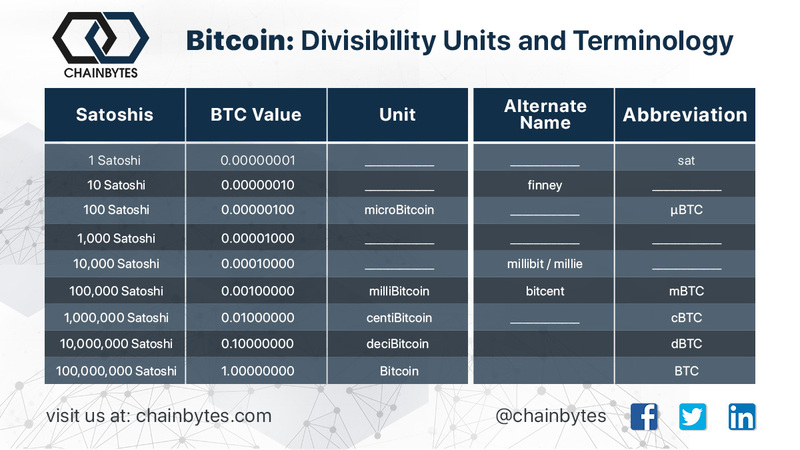 Bitcoin’s divisibility could be a factor that contributes to its adoption because it will facilitate a wide range of payments that will not be possibly with traditional currencies and payment methods. Online monetization and international remittances services can benefit from this feature. Traditional cross-border payment solutions usually require a minimum amount and generate a fee, making micropayments unfeasible; however, micro cross-border payments are possible with Bitcoin and more use cases will continue to appear as cryptocurrencies evolve. Subscribe to our free newsletter and get interesting stuff and updates to your email inbox. Thank you for signing up! You must confirm your subscription so you can start receiving emails from us. Please check your email and follow the instructions.